College education is becoming more and more essential to working in the US. How do you ensure that your children will have the opportunities that come with education? Are you setting enough aside? If you’re like most parents, you probably feel some anxiety about how you will finance your child’s college education. 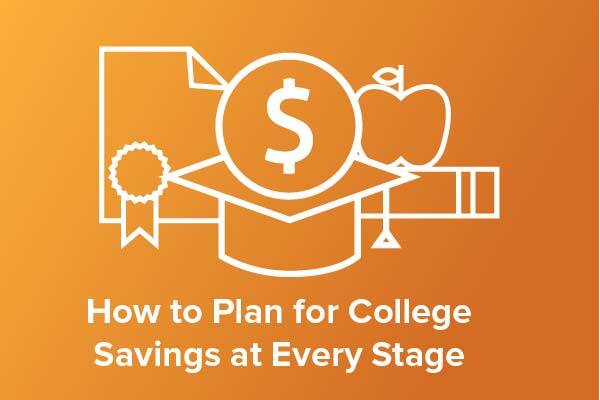 Though families are recognizing the necessity of college and are saving for it at record rates, it can be unclear how much you need to save at each stage to feel at ease. Almost 40% of parents have no plan for college savings (SallieMae Bank, 2016). Saving something now is always better than putting it off – and waiting until student loans come due is a sure way to feel uncertain about your child’d future. 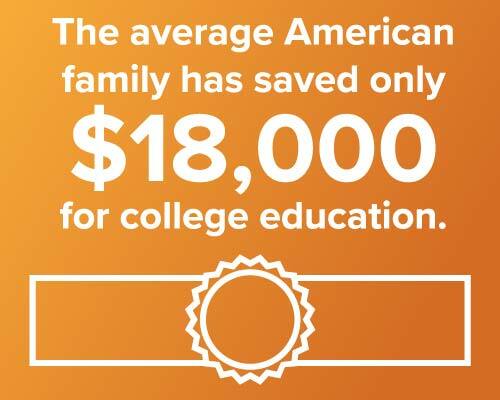 The average American family has saved about $18,000 for college(SallieMae Bank, 2016). While that amount may feel substantial, it isn’t enough if your child is older than 9 years. Whether you have set aside too little or none at all, don’t get discouraged. Prioritizing college savings isn’t easy when there are bills to pay and you still have the competing priorities of saving for emergencies and retirement. There’s only so much income to go around. If you’re like most parents, you probably feel some anxiety about how you will finance your child’s college education. Unless your kids are currently finishing up high school, there is still time to build up a solid college fund. To make it work, you’ll need a plan that establishes where you are and where want to be given variables like time, income, other saving priorities, and debt. First, determine how much you’ve already saved. Exclude emergency fund savings of at least 6 months of expenses in case you lose your income, or more if your job is difficult to replace. Look only at what you’ve saved for education – not a new house, car, or another investment. Next, look at how much you should have saved in a college fund based on your child’s age. The “2K rule” makes this calculation easy. Simply multiply your child’s age by $2,000. If you have a six-year-old, you should have about $12,000 put aside for college, which would put you on track to have about half of your child’s education at a typical four-year state university. 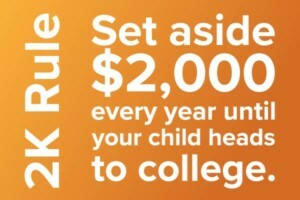 The other half of your child’s educational expenses would come from financial aid, student loans, and family earnings. While 2k per year is comfortable to work with, if you expect that you won’t qualify for financial aid that figure should be greater to compensate. If you expect that your child may go to a more expensive college or university, know that financial aid opportunities at more elite institutions may be greater. On the other hand, if you expect to pay most of the college expenses, an elite school will require greater investment. Whether you have more or less than you should, knowing where you stand is the first step in formulating a plan to catch up in the time you have left. 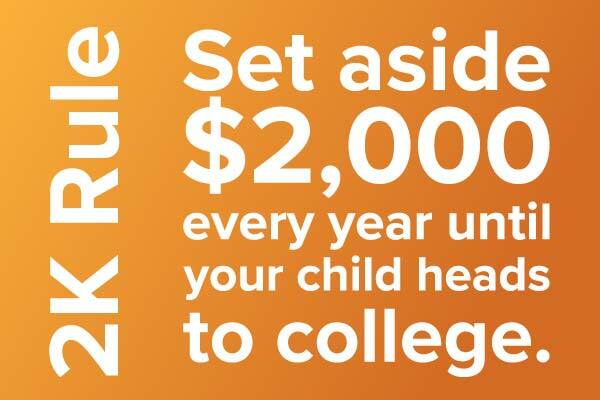 Take every step you can to minimize the debt your child has to take on for a college education. Any investment you make in your child’s education depends on how much time you have to save. Consider protecting your family from the unexpected with a life insurance policy to ensure that no matter what happens between now and graduation, your children will have what they need to pay for college. Find out what you can do to catch up on college savings in our next post where we will discuss practical and creative ways to plan for college expenses when time is of the essence.